Narsimha Jayanti is another important festival among the Hindus and is celebrated on Vaisakh Chaturdashi (14th day) of the Shukla Paksh. Narsimha is the fourth incarnation of it Lord Vishnu where he appeared as a man-lion that is the face was like a lion and the trunk was like a man. He had killed demon Hiranyakashipu on this day. All Lord Vishnu devotees also observe fast on this day. It is known that Narsimha appeared during the sunset on Chaturdashi and that is why the puja is performed during those hours. 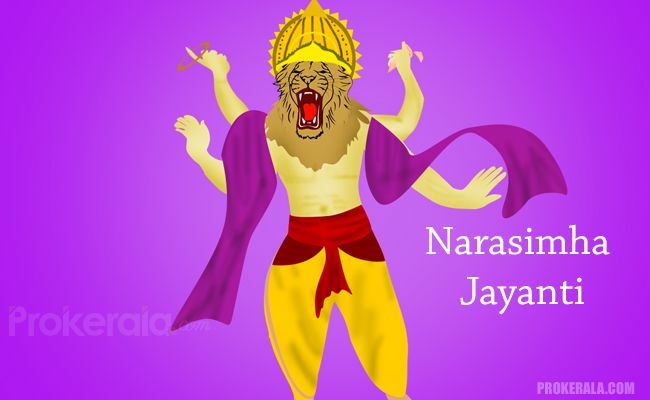 The purpose of Narasimha Jayanti is to remove adharm and to follow the path of dharam. Dharam is to perform correct deeds and not harm anyone. Special puja is performed on this day with idol or picture of Lord Narsimha and Goddess Laxmi. Devotee should wake up early during the Brahma muhurat and take a bath. He or she should wear new and fresh clothes. Devotees should perform puja and offer gram dal and jaggery to the deity. The puja ceremony should be done with friends and relatives offering items like flowers, sweets, kumkum, kesar and coconut. Fast on this day starts with sunrise and continues until the next day’s sunrise. One can have one in the day that should be without any kind of cereals or grains. Narsimha mantra should be recited with rudraksha mala to please and the God and attain a more meaningful life. It is good to donate clothes, precious metals, and sesame seeds on this day to the poor. Fasting on Narsimha Jayanti is said to relieve all problems of devotees. They should try to meditate and recite mantras in isolation for better results. There are numerous temples in southern India that are dedicated Lord Narsimha where regular prayers and pujas are offered to the Lord. Strong dedication is required to be priests in the temples of Narsimha and devotees should also meditate while in temple.